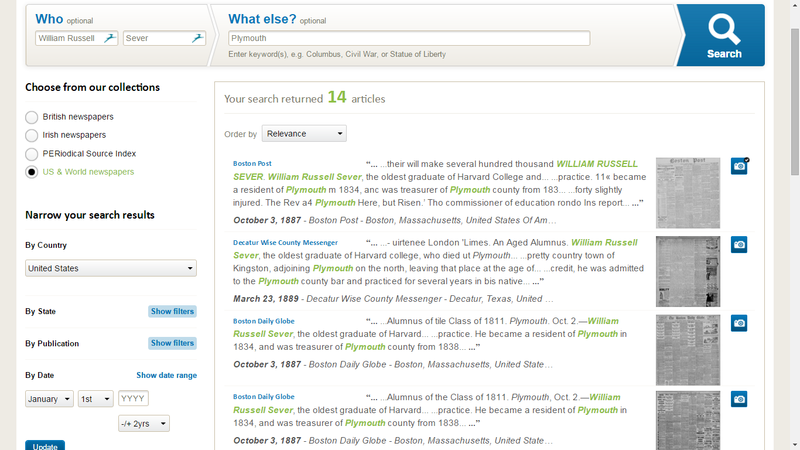 I recalled that Findmypast had added the NewspaperARCHIVE collection recently, and knew that several of my distant Seaver and Sever cousins had obituaries written about them that might be in the collection. The first match on the list is from the Boston Post newspaper dated Monday, 3 October 1887; there are thirteen other articles from newspapers all over the United States. I couldn't read it clearly, so I downloaded the page, then opened my photo program and was able to magnify the image more. grandfather were all graduates of Harvard. William R. was fitted for college by the Rev. Judge Ebenezer Lane, Judge Benjamin F.
Dr. Parkman. 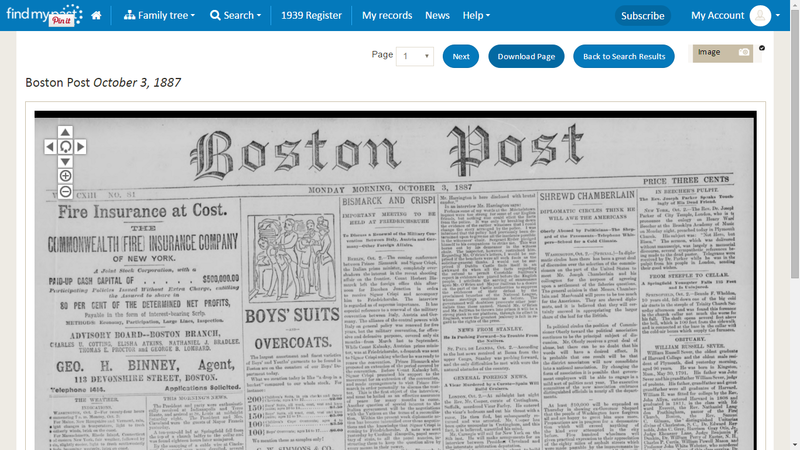 None of this class survive, Dr.
"William Russell Sever," The Boston [Mass.] 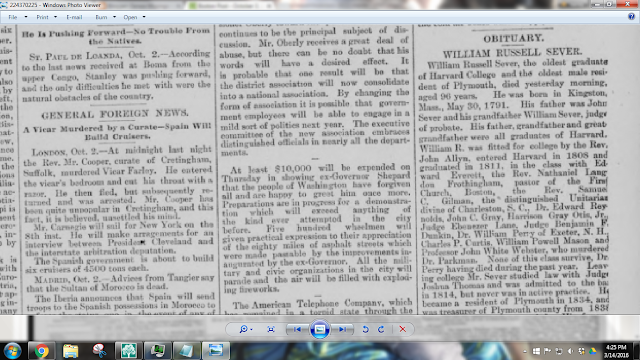 Post, Monday, 3 October 1887, Page 1, Column 7, William Russell Sever obituary; digital image, Findmypast (http://www.Findmypast.com : accessed 14 March 2016), U.S. and World Newspapers collection, accessing NewspaperARCHIVE (http://www.NewspaperARCHIVE.com). I can now add this obituary transcription to the Obituary Note in my RootsMagic 7 database. William Russell Sever (1791-1887) was the son of John and Nancy (Russell) Sever of Plymouth, and is my 4th cousin 6 times removed. I love that the Harvard men (and the media of the day) always knew who was their oldest living graduate (OLG). I have a second great-grandfather who, when he died at 91, was the OLG of Harvard. See Sunday's Obituary ~ Samuel Sewall Greeley 1916 .